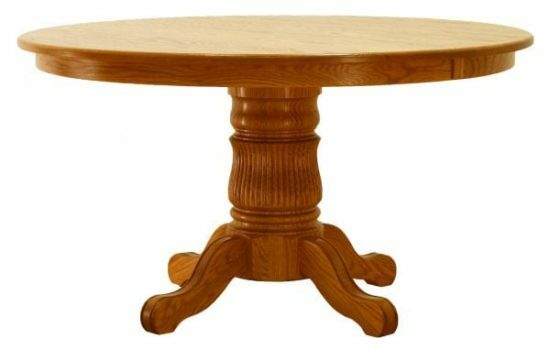 54″ Single Pedestal Table shown in Oak. Standard Features: 2 1/4″ wide skirting, #100 edge, double equalizer slides, self-storing leaves, Turned single pedestal, Prince feet. Options: Round top, oval top, square/oval top, 6″ Tulip pedestal, 8″ Tulip pedestal, 10″ Tulip pedestal. Available in sizes: 36″ round to 60″ round (6″ increments).